Melanins are ubiquitous macromolecular pigments with unique biological functions and unknown molecular targets. In fungi, melanin is an essential cell wall component that confers resistance to environmental stressors and protects conidia (spores) from killing by phagocytes. However, the signaling pathways regulating fungal phagosome biogenesis and the molecular mechanism that melanin interferes with this process remain obscure. In previous work we identified the essential role of LC3 associated phagocytosis (LAP) in phagosome maturation and killing of the major human fungal pathogen Aspergillus fumigatus. LAP is a noncanonical autophagy pathway regulated by Rubicon, in a process that requires NADPH oxidase complex dependent ROS production for subsequent LC3 recruitment to the phagosome. We have recently discovered that Aspergillus cell wall melanin selectively disrupts NADPH oxidase complex assembly on the phagosome to inhibit LAP and promote pathogenicity. Notably, inhibition of LAP is a general property of melanins, which is independent of their antioxidant activity. Thus, solving the mystery of how structurally unrelated pigments inhibit the LAP pathway became a research priority in our lab. We hypothesized that a shared physicochemical property of melanins underlies their ability to inhibit LAP. However, identifying the precise molecular target of melanin was a challenging task, because the signalling regulating LC3+ phagosome (LAPosome) formation upstream of Rubicon and NADPH oxidase complex activation was completely unknown. Therefore, we focused our initial studies in identifying early signaling events regulating LAP. In view of the master regulatory role of calcium/calmodulin (CaM) on phagosome biogenesis and canonical (macro)autophagy, we evaluated the role of CaM on activation of LAP and the interference of melanin with this process. We initially infected primary human monocytes with melanin-competent and melanin-deficient (albino) cell wall mutants of A. fumigatus generated by Jean-Paul Latge group and evaluated CaM recruitment to the phagosome by confocal imaging. Strikingly, we found a transient and selective recruitment of CaM exclusively in the phagosomes of Aspergillus melanin deficient (albino) mutants, a phenotype that was validated with the use of additional fungal strains provided by Kyung J. Kwon-Chung and Axel Brakhage. In subsequent studies, we documented that CaM is a master regulator of Rubicon, NADPH oxidase complex assembly and other downstream molecular components of LAP, demonstrated that calcium/calmodulin signaling has a significant role in the killing of the A. fumigatus by monocytes and verified that this pathway is targeted by melanin. In order to dissect the mechanism of CaM-dependent activation of LAP we utilized high speed calcium imaging, molecular biology tools, and analytical chemistry studies on fungal conidia, immune cells and isolated phagosomes. These experiments demonstrated that a localized calcium signalling pathway that depends on intracellular calcium sources from the endoplasmic reticulum (ER), ER-phagosome communication, and peri-phagosomal calcium release, regulates CaM recruitment to the phagosome and LAPosome formation. Notably, our experiments with phagosomes isolated following stimulation of monocytes with EDTA-coated magnetic beads provided for the first time direct experimental evidence on the important role of luminal calcium in the phagosome on regulation and LAP and phagolysosomal fusion. In parallel, Agostinho Carvalho and collaborators found genetic evidence on the physiological importance of Calcium/calmodulin pathway in development of invasive aspergillosis in humans. Following the identification of the calcium signaling regulating LAP, we systematically analyzed the inhibitory action of melanin on individual molecular components of this pathway. A striking observation in high speed calcium imaging studies was the lack of peri-phagosomal calcium release following infection with melanin-competent conidia, which was validated by measurement of phagosome calcium content over time by inductively coupled plasma mass spectrometry (ICP-MS), performed by Julio Landero group. In contrast, we found no evidence of inhibitory action of melanin on ER-phagosome membrane communication. Therefore, we evaluated further the mechanism of interference of melanin with calcium release from the phagosome lumen to the peri-phagosomal area. We specifically asked whether fungal melanin could display calcium scavenging properties that result in inhibition of peri-phagosomal calcium release. Intriguingly, in a literature search, we found that metal binding is a well characterized physicochemical property of melanin pigments that accounts for calcium sequestration in pigmented tissue and retina. Furthermore, we realized that calcium binding by melanins has no clear biological role. Analytical chemistry studies with melanin-competent and melanin-defective (albino) conidia demonstrated that fungal melanin possess strong calcium binding properties that result in calcium sequestration inside the phagosome, thus abrogating calmodulin recruitment and preventing activation of LAP. Finally, in proof of concept studies, we found that stable chemical ligation of a calcium chelator on albino conidia (generated by our collaborators Nuno Neves and Helena Ferreira), mirrored the effects of melanin on inhibition of calmodulin recruitment and LAP. Our study shows for the first time that calcium sequestration by melanin has an immunological function and is specifically responsible for LAP blockade. Therefore, our work provides mechanistic explanation on the ability of structurally unrelated melanin pigments to inhibit LAP. In addition, in view of the physiological importance of both melanins and the LAP pathway in humans, our findings have broader implications in the pathogenesis of diseases beyond fungal infections. Although our study adds another piece to the puzzle of enigmatic biology of melanins, new important questions have emerged from our findings. First, the calcium transporters regulating ER-phagosome communication, peri-phagosomal calcium release and CaM recruitment to the phagosome remain to be identified. 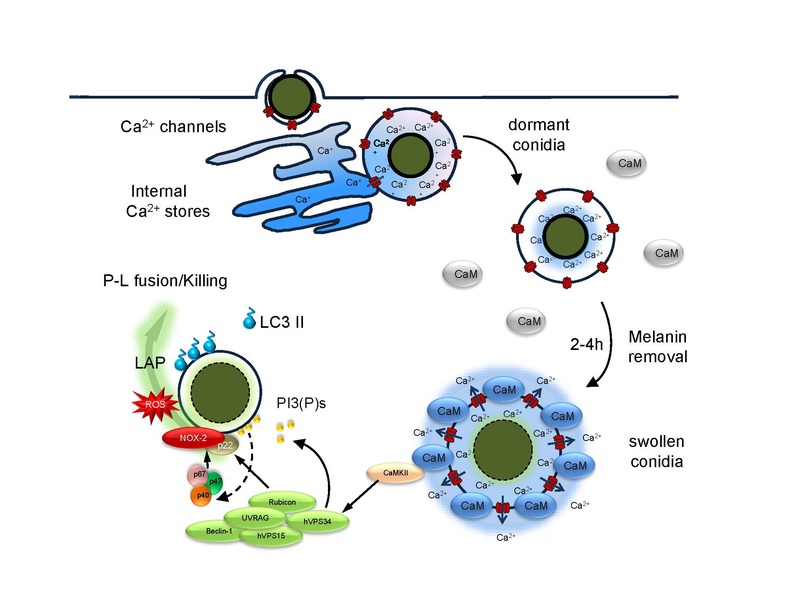 Second, the direct inhibitory action of melanin on (i) transmembrane ionic currents and/or (ii) calcium transporters could be an alternative mechanism of calcium sequestration inside the phagosome that deserves exploitation in future studies. Third, it is important to understand the precise role of ER-mitochondria and mitochondria-phagosome communication in regulation of calcium/calmodulin signalling and LAP. Finally, from the pathogen perspective, it will be important to dissect the molecular events leading to melanin removal from the fungal cell wall surface during the course of intracellular swelling of conidia inside professional phagocytes. We hope that our work will foster research on the fascinating field of melanin interplay with calcium signaling and the phagosome.